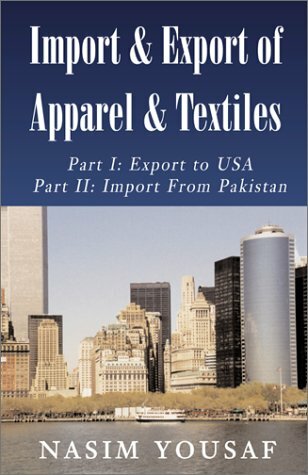 This book is helpful for importers as well as exporters of apparel and textiles to the USA. Exporters from different countries will hopefully make use of the information I share in this book. The book targets importers, exporters, business executives, textile industry professionals, students, etc. Before I mention what this book is all about, let me remark on how the idea of writing first came about. I have been associated with international trade for over 20 years. Having lived in both Pakistan and the US, I have been able to obtain a vast knowledge on importing and exporting. I have also traveled extensively throughout the world, which has enabled me to gain a great deal of exposure, knowledge, and information on global trade. Over time, the idea of putting all my experiences together began to develop in my mind. I am not aware of any other book that serves as a complete guide for importers and exporters of apparel and textiles to the USA. In the book, I have tried to pass on my knowledge of business to both importers and exporters. The book discusses different steps one needs to take in setting up a business. It explains everything from the advantages of the export business and the production of apparel to making a practical entry into the US apparel and textile market. It also provides valuable information to entrepreneurs in the US and elsewhere, who might be interested in importing apparel and textiles from Pakistan. This information will save a tremendous amount of time for any importer or exporter, especially beginners. It is designed to give a head start to any entrepreneur. I have tried to keep this book error free to the best of my ability, but I apologize if any mistakes or inaccuracies are found or if there is a disagreement on an opinion. Part 1: Export to the USA This part provides a wealth of information for exporters around the world who want to sell their products to the US. It covers topics in depth, including methods of finding US buyers, market research, important trade shows, options of selling, web sites of designers and large US chain stores, garment production, apparel machinery, fashion and color forecasting information, and much more! Part 2: Import from Pakistan This part serves as a guide for importers on how to acquire apparel and textiles from Pakistan. It provides information on how to reach Pakistani manufacturers, exporters, and more. Mr. Nasim Yousaf started his career as a Pilot Officer in the Pakistan Air Force. He resigned after serving for approximately two and a half years. In the late 1970´s, Mr. Yousaf began exporting textiles and apparel from Pakistan. As a result of his business acumen, he achieved success at a very young age. One of his companies in Pakistan earned merit certificates, for its commendable performance in export for three consecutive years, from the Rawalpindi Chamber of Commerce and Industry in Pakistan. Approximately, 10 years ago, he moved to the US, and has resided here ever since. His knowledge on trade is a result of his experiences in Pakistan, the US, and his extensive travel across the world. Mr. Yousaf was a member of the Board of Directors that founded The Pakistan Commercial Exporters of Towels Association (PCETA). He also held other important positions in the PCETA including Vice Chairman (North Zone), Member of the Central Executive Committee, and a Member of the Textile Quota Committee of the PCETA. While in Pakistan, he also represented the business community at different forums. He has attended various seminars on international trade sponsored by reputable organizations such as the United Nations Conference on Trade and Development (UNCTAD), the Export Promotion Bureau of Pakistan, and the Australian Embassy in Pakistan. In the course of his business activity and personal capacity, he has met with many dignitaries, including Pakistani Federal Ministers and Heads of Government. He has participated in various social gatherings within the industry and the business community, including an industry breakfast in the USA where former President George Bush graced! the occasion. More recently, Marquis, reputable and renowned publishers of Marquis Who´s Who directories, recognized the achievements of Mr. Yousaf by including his biography in Who´s Who in the World 2001. In over two decades of being associated with trade, Mr. Yousaf has traveled the world. His knowledge and learning have been a result of his extensive travel and meetings with people from various backgrounds, nationalities, religions, and cultures. His companies have exhibited their products numerous times in Europe, Asia, and the Middle East. Mr. Yousaf´s knowledge on international trade is a result of his experiences across the world. The author is related to two legends from Pakistan, Allama Mashriqi and Dr. Akhtar Hameed Khan. Both of these personalities greatly contributed to the Muslim cause. The former was his grandfather and the latter was his uncle. Allama Mashriqi was a scholar and founder of the Khaksar Movement in Indo-Pakistan. Mashriqi had a large number of followers who were devoted to his movement. He was a genius and broke many previous academic records at Punjab University in Pakistan and at Cambridge University in England. He authored many books. His most famous work, Tazkirah, was nominated for the Nobel Prize in Literature. Allama Mashriqi played a vital role in the creation of Pakistan. Mr. Yousaf´s uncle, Dr. Akhtar Hameed Khan, was a social scientist. Millions benefited from his Orangi Pilot Project and Comilla Rural Academy. He was a recipient of many prestigious civil awards including Nishan-i-Imtiaz, Sitara-i-Pakistan, Hilal-i-Imtiaz, and the Magsaysay Award. Michigan State University awarded him an Honorary Doctorate, and he was a visiting Professor at Harvard (USA), Princeton (USA), Oxford (U.K.), Michigan State (USA), and Lund (Sweden) Universities. He also authored many books and papers. Mr. Nasim Yousaf is proud to be part of a family whose contributions toward Pakistan are unparalleled.